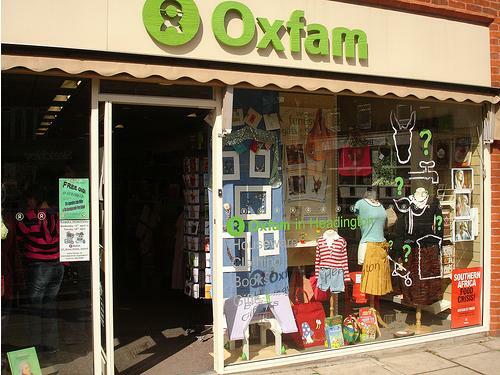 Opening in 1947, Oxfam was the first organisation to open a charity shop as we know them. After being swamped with donations for it’s appeal to help Greece after the second world war, it was decided to set up a shop in Oxford to sell some of the donations and use the profits to fund further aid. Unfortunately though, there is a stigma attached to charity shops. Who wants to buy someone else’s smelly, old, washed out t-shirt? Having been traditionally frequented by people of an older generation to buy cheap wool and curtain fabric, the customers using charity shops are changing. There are an estimated 7500 charity shops in the UK and they are becoming ever more popular for the discerning and fashion conscious shopper as the credit crunch bites. Vintage shops are also springing up as trends come round again and fashionistas want one off items that are a bit different. Problem is, for the same reason that we like to buy vintage, the price tags on these items would often be more like what you’d expect to pay for a designer piece. The savvy shopper will turn to charity shops. Most of the items branded ‘vintage’ will have come from charity shops, flea markets and car boot sales and the seller would have originally bought them at a fraction of the price. All it takes is a little more patience and imagination and you can bag yourself some great items at a great price, whilst donating money to a worthy cause. 1. Be open minded and creative. Not many items will be wearable as they are on the hanger – think about customising with a belt, corsage or even alterations on a sewing machine. 2. Find areas out of main town centres. Young people, students and the fashion conscious will have rummaged in the charity shops in city centres inbetween trips to Topshop and H&M. You can often find gems in small suburban towns. 3. You need more time to sift through the rails in a charity shop. There will be a lot of rubbish but looking through carefully and imaginitively will find you the best items. 4. Don’t buy for the sake of it. Although they’re very cheap and you’re giving to charity it’s not worth buying tatt. Always look at the label on the item and if it’s from a low end brand/shop, chances are it would have only been a few quid more brand new. 5. Don’t have too much in mind. You never know what you’ll find and so if you’re looking for something in particular you will usually come home empty handed. A rough idea can be helpful and save time but being too specific may mean you miss great buys. Fashion guru and shopper extraordinaire Mary Portas, who you may remember from the BBC2 series ‘Mary Queen of Shops’ which transformed failing clothing shops into successful designer boutiques is also a fan of charity shop chic. In her new series which starts tonight on BBC2 at 9pm, Mary wants to remove the stigma from charity shops and get everyone shopping in them. She’s been working on the project for the last six months, converting designer divas and working with charity shop staff to make the stores more welcoming and easier to navigate around. She will also be opening her own charity shop, initially for one month to coincide with the new series. The store is situated in swanky mall Westfield London and will be opened alongside the likes of Louis Vuitton and Dior. It’s called Mary’s Living and Giving shop and she hopes it will encourage retailers and customers to donate high-quality clothes to charity. Found your web site on AskJeeves, great written content, but the site looks awkward in my browser setup, but performs fine in IE. turn figure.